The minerals of Mother Earth are rich in power and magic. They have a long history of helping us focus our thoughts and prayers. Through their ability to focus and amplify our power of concentration, they have found a valuable place in the practices of meditation and ritual. The use of minerals and crystals in rituals associated with Goddesses and the glory of the Divine Feminine have a long history in many cultures. The Divine Feminine is an ancient concept found in many of the oldest cultures of the world. From the "Egyptian Book of the Dead" with Isis, Nuit, and other Goddesses to the recent popularity of "The Da Vinci Code", the feminine role has been prominent in legends, religions, and belief systems. Galen Gillotte's excellent book Sacred Stones Of The Goddess provides us an outstanding guide to rituals and mediations to focus our lives and provide ourselves with the understanding and appreciation of what the Divine Feminine can contribute to our self awareness, self identity, and our self knowledge. The book offers detailed explanations of each of the following Goddesses and provides appropriate rituals and mediations focused on each. The table below is based on partly on Galen's book augmented by further research, particularly at the comprehensive site, The Obsidian's Dictionary of Pantheons. The list below is an introduction to Goddesses and their crystals, certainly by no means a complete list, but it is a good beginning for anyone interested in understanding how to bring the Divine Feminine power into your life. Scan down the list carefully and determine if any of the goddesses seems to call to you. We are in the process of bringing you a fresh look at each of the Goddesses. Jessica Sitarik, at age 14, started this project and researched many of the Goddesses, and written a short description of them. She explained why the Goddess is important, and how the Goddess can help you in your life. As we add to her work, you will see more and more of the Goddess names in the table below become links. You will find many crystals suitable for Goddess rituals here at the Crystal Vaults. 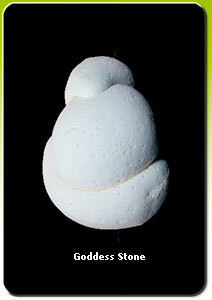 We also carry Goddess Stones. The crystals offered on this web site are certified as natural and authentic by a Graduate Gemologist. Each of the crystals in the Goddess Gallery is hand selected and suitable for bringing the power of the Goddesses and the Divine Feminine into your life and home. Drop us a note if you need something special or have a question.